I know just enough about computers to be extremely dangerous. Everything that I do know about computers has been self-taught by asking a lot of different people a lot of different questions along with a lot of trial and error. If this description reminds you of yourself, then this primer is for you! The instructions for MMP (i.e., "Massive Multi-Player") in the original manual that came with the boxed copy of Red Baron 3D (hereafter referred to as RB3D) are limited at best. After reading this document, you'll see what I mean! Before you do anything else, go to Sierra's RB3D website, or look around here at Wings of Honor. You'll find a number of different game patches that fix a couple of leftover "bugs" in the game. If you don't have KALI (see KALI under ODDS & ENDS, below), the patch that you will need in order to see all of the servers is Sierra's 1.0.7.8. patch. Downloading this patch assumes you already have RB3D installed on your computer. Some players will tell you that the 1.0.7.8. is the source of the infamous "flamer bug," but this isn't true. You will risk being ejected by flamers whether you have the patch or not. More on the "flamer bug" later. You're now ready to dogfight on-line, quickly and easily. Instead of clicking on the Dogfight On WON.net button in your introductory menu, click on Quit, which of course will take you back to your desktop. Now, left-click on the RB3D shortcut you just made specifically for MMP on your desktop. MMP will fire up immediately and take you to your Pilot Roster. This is where you can use an existing pilot, create a new pilot to fly on-line, or delete an old pilot that you don't want to use anymore. This screen is also where you set your on-line flying preferences similar to what you're already used to in SP. More on this later. On the Pilot Roster screen you'll see a Connect button. By left-clicking on this button, you'll be taken to a screen that lists all of the available RB3D servers that are currently on-line. So many to choose from!!! Some of the servers will have a small "padlock" icon next to them. This means that the server is restricted to pilots that have been issued a password to enter the server. Passworded servers are usually set up by squads involved in organized "wars" or training sessions for their members. NOTE: This is another advantage to logging on via your "shortcut" button. If you try to enter through WON.net, their listing of available servers will not indicate which ones are restricted. Server Name. Each server has been given its own name, at the sole discretion of the server operator. Ping Rate. This is the number that tells you how good of a connection you can expect from that particular server with your computer. Ping rates will depend upon your ISP, your local telephone service, the type of connection you have, the type of modem you have, etc. Ping rates of under 200 are considered excellent. Ping rates of 200-300 are OK but not great. Over 300 pings and things start to get a little "iffy"; the "lag" on these servers makes it all but impossible to fly with any accuracy or skill and you end up with a lot of "netting." "Netting" is when you're on-line and you see a little black box with the word NET inside of it appear in the upper left-hand corner of your computer screen. This means that your computer has temporarily lost contact with the server and is trying to re-connect. When it does, usually in just a couple of seconds, you'll see "lag effects" i.e., targets that you thought were right in front of you zoom off all of a sudden at warp speed! If the NET message stays on for too long, you will lose your connection entirely and you'll get a little pop-up message telling you that your connection has timed out (also known as a "mech"). When you click the "OK" button on this pop-up screen, you'll be taken all the way back to your Pilot Roster screen and have to re-connect with the server all over again. This can be frustrating, which is why it's so important to check ping rates before logging onto any server. If the word NET appears in the upper left-hand corner of your screen for an unusually long-period of time (say, over 30 seconds), chances are your computer has frozen up on you, leaving you sit there wondering what to do. At first, I was re-booting my computer by pressing my CTRL+ALT+DEL keys until somebody informed me that, not only was this unnecessary, it was also hard on my computer. The best thing to do in this situation is to hit ALT+F4. This will kick you out of RB3D and send you back to your desktop to start all over again. Here are a few tips that I learned to maximize the game's performance on-line, particularly if you have a slower computer (like me!). The first one is to go into your preferences from the Pilot Roster and reduce some or all of your graphics detail. The second one is to download a nifty little piece of "freeware" called "End It All." You wouldn't believe all of the junk your computer has running in the background while you're trying to fly; this can only deteriorate your FPS (Frames Per Second). "End It All" enables you to shut down all of the unnecessary stuff while keeping the necessary stuff in play. It's very easy to download and use. Finally, I recommend that you reduce your "chat buffer" settings. Reducing the number of chat lines that appear in the upper left-hand corner of your screen while flying--and how long the chat stays on your screen--will improve your connection and reduce nets. To adjust the chat buffer, right-click anywhere on your on-line screen with the mouse while in MMP; I recommend doing this on the ground at your aerodrome! This will bring up a pop-up menu by which you can make several different preference adjustments without having to go back to your Pilot Roster screen. Among the different buttons you can choose from on this pop-up menu is one labeled "Chat." By left-clicking on this button, you'll be able to adjust the "chat buffer" to your liking. You'll need to play with the settings a bit to find what works best for you. If the chat buffer is set too low, you might end up missing potentially important items. If you think you missed something important, simply hit CTRL+PGUP to view earlier chat lines. Get The Baron is like a huge game of tag around a single aerodrome. When you shoot down an enemy plane, your plane will turn to a color selected by the computer, and you'll see a computer-generated message in the "chat scroll" announcing your new status (e.g., "LWulffe_Herr Mac is now the blue baron"). If you shoot down the Baron, you will in turn become the Red Baron and everyone will be gunning for you! Melee is similar to Get The Baron in that all of the action takes place around a single aerodrome. The only difference being that your plane doesn't turn color when you shoot somebody down. In melee games anyone and everyone are your enemies! Team Melee and Team Target are the final two on-line options and are, in my opinion, the most enjoyable of all the games because they feel more like real air-to-air and/or air-to-ground combat with a lot more strategy involved. Get The Baron and Melee are more "arcade-like." I will usually fly on a Team server when I have the luxury of a couple of hours (literally!) to spend on-line; I'll opt for a Melee server if my flying time is limited or if I just feel like a quick game. 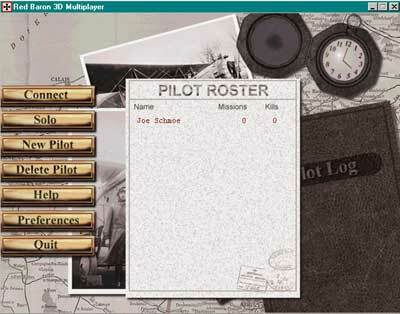 In Team Melee, you basically choose the side for whom you want to fly (Allied or German), and then take to the skies over the front in search of each other. In Team Target, you do essentially the same thing; however, the computer will select targets at timed intervals on either side of the front for bombing purposes. Your team scores points by taking out the enemy targets. You will see red squares around these targets on your kneeboard map. In organized servers and wars, bombing will be restricted to certain aircraft, typically the "monos" (e.g., Fokker Eindecker, Moraine Bullet) or any other of the older, slower aircraft. On "open" Target servers, however, I've found that you can usually make bombing runs in any aircraft; still, the polite thing to do is to ask on chat ahead of time if bombing is allowed for any plane. You should also ask if there is a rules website for the Target server. Many servers, such as HiE's and the Lone Wulffe's, have rules pages established for fair play and fun. Game Difficulty. Ace, Veteran, or Novice. Self-explanatory. These indicators will typically appear before the game type—e.g., "Novice Melee," "Veteran Team Target," etc. Flight Mode: Advanced Flight Mode (AFM) or Normal Flight Mode (NFM). Once you get into this game on-line, it won't take you very long to start hearing pilots voice their opinions in regards to the great "AFM v. NFM" debate. Here's the gist of the argument: Sierra's FMs are far from perfect and have certain quirks depending upon which FM you choose to fly in. In AFM, many planes (all planes, according to some) will "uber" with damage, which means that their flight characteristics will actually improve (i.e., climbing and/or turning). In NFM, many of the planes actually seem quite a bit easier to fly, but when you take damage, your aircraft's flight characteristics will definitely worsen! In addition, as you turn, especially near ground level, your plane will slow down and may even stall, so you need to be much more aware of you craft's "energy status." To learn more about energy fighting, I highly recommend reading WWSensei's "Energy Primer" found here on Wings of Honor. Number Of Players. This will appear as two numbers separated by a slash (/). The first number represents the number of players currently in the game, while the second number represents the total number of players that the game can accommodate. Once you've found a server that’s running a game you'd like to join, highlight it with your cursor and double-click on it. You'll soon find yourself inside "the lobby" for that particular game.